Cox EZ Bee II - Pleased! 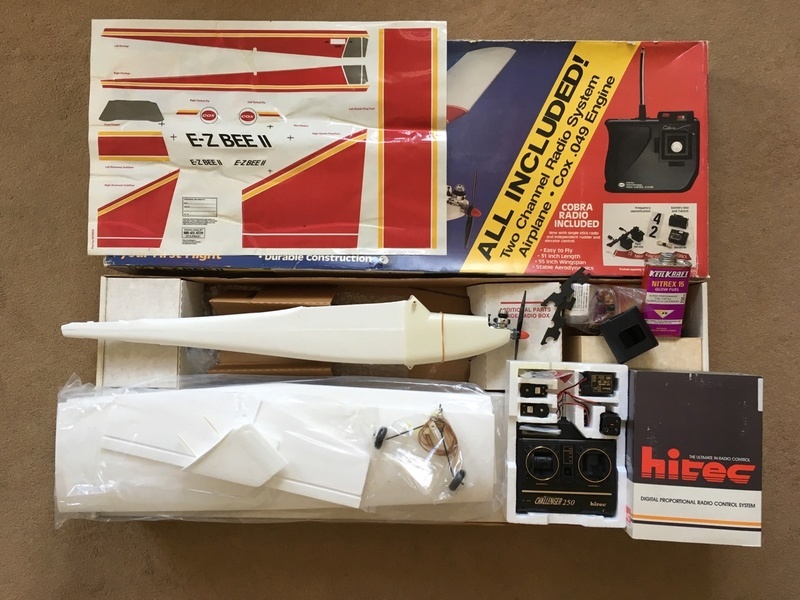 Probably not the most reminisced of the Cox models since it originates in the mid 80s and it is firmly in the foamie camp which many of us IC guys dissaprove of but I noticed this EZ Bee II for sale on eBay and decided to bid and see what happened. Having received it in the mail this morning I quickly realised that this purchase represents incredible value. Even my Q-Tee cost more to build and it did not include a brand new babe bee engine, #2630 muffler, Hitec Challenger radio system, complete #400 Cox starter set including a full bottle of Keil Kraft Nitrex fuel! OK, it's not really safe to fly 27mHz AM anymore but the servos are usable and there is a market for those 2ch AM radios among RC car guys. The fuel is also stale by now but I already have enough that I'm set for a season or two. Only question remaining is when will the wind calm down so I can get it in the air? Re: Cox EZ Bee II - Pleased! Hello Simon, first of all I congratulate you on your new acquisition, it is a beautiful model of the Cox RC aircraft era. I remember in my country in a hobbi store, see them hanging from the ceiling, several models like this one! I hope you enjoy it, and that the wind calms down, so you can make a few flights, which logically I hope to see some video here! Even more pleasing: The fuel, unopened but dating from the early 1990s, is still good! Out of curiosity I tried a tank of it through a Pee Wee I'm refurbing and it seems OK. Unfortunately the servos that come with the included hitec radio are a little too big for the servo pockets in the fuselage and don't play nice with the telemetry on my JR XG8 radio. They're fine with the old 27mHz radio that they came with but I can elicit a jitter mode on my JR radio by wiggling the sticks very quickly. The pockets are molded to fit Cox/Sanwa 80111 servos. I will try and source something smaller and fill in the gaps I think. The other issue is adhesive on the stickers is quite dry so, if I use them, I'm going to have to spray their backs with something like 3M 77 (safe on foamies) before sticking them to the plane. This evening I spent some time putting the model together. The wing joining tape was still OK but I had to spend time spraying the back of the decorative stickers with 3M77 because their adhesive had dried up. As someone who usually builds his own models and takes some pride in their fit and finish I was slightly annoyed that the tail is quite far from vertical when installed. Not sure if I can correct that on a polystyrene part. I must admit I was expecting a smaller model until I received the box in the post. 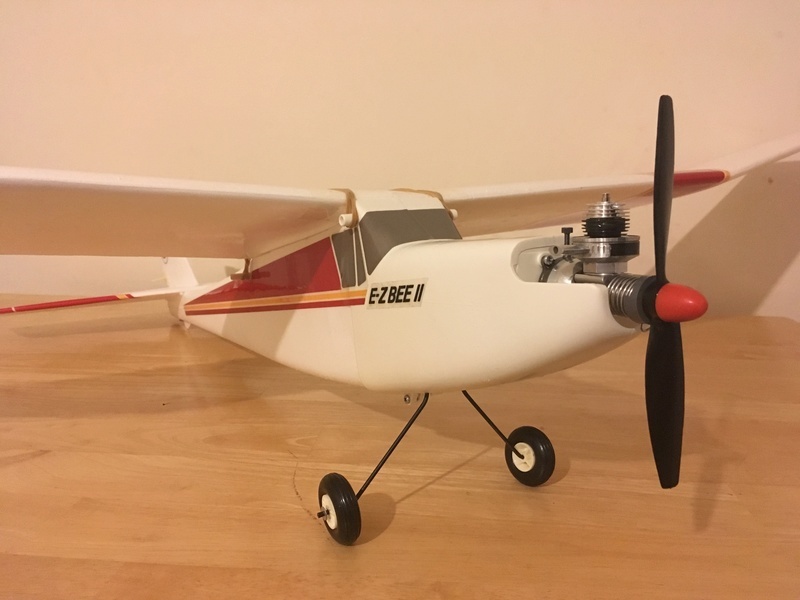 For a 1/2a size model this has a large 55” span which I hope will combine my gliding interest with my love for Cox Engines. Definitely the right model for me at least in terms of its flight profile of climb and glide. Just need to find some servos now. 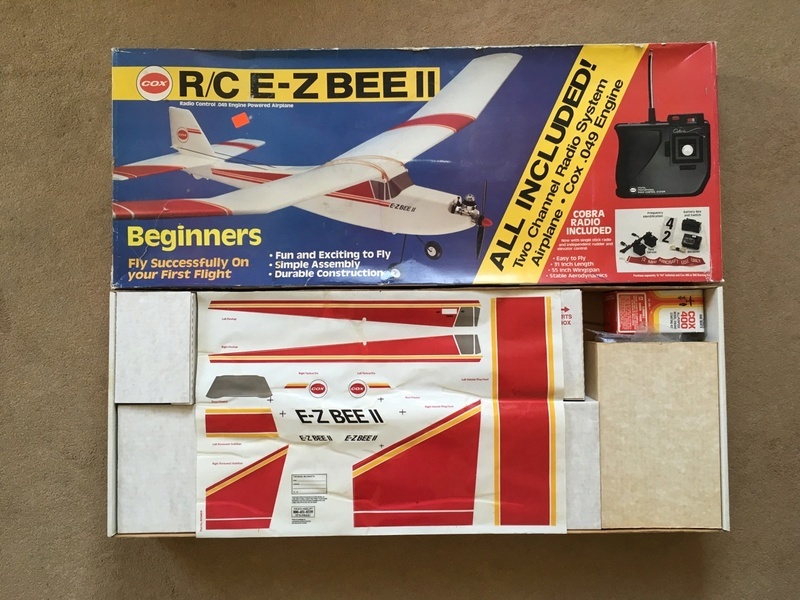 The EZ-Bee is what I used to teach myself to fly RC almost 30 years ago. I love those planes. 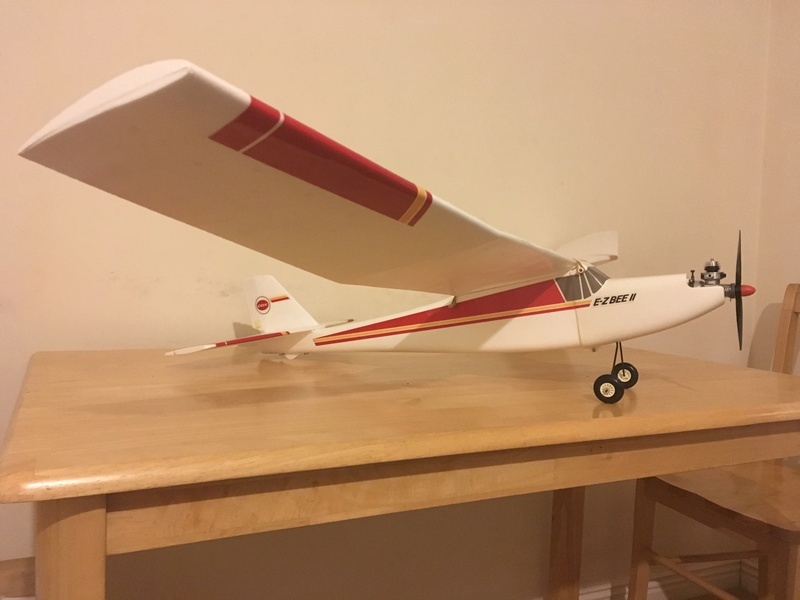 I can't remember why I got my first one used from a hobby shop, but I flew the heck out of that one. Then when the wing broke from a few crashes, I bought a new one and flew the heck out of that one. I ended up given them away when moving, but I bought a NIB off eBay a couple of years ago and built it. They were stable enough that you COULD teach yourself to fly with them. I remember one day I was at the open field we used for RC flying (that is, when the airplanes/homebuilts/skydivers weren't using the field) and flying my trusty EZ-Bee. I was talking to one of the other flyers as I started up the engine and gave the plane a toss. Then I turned around to look at him to answer a question and he said, "Watch the plane!" I said, "Oh, it'll be okay", and deliberately kept my back to the plane and talked to him for about another 20-25 seconds before I turned back to look at the plane. It was climbing out nice and straight as I knew it would be. That polyhedral wing makes it one of the most stable planes you'll find.